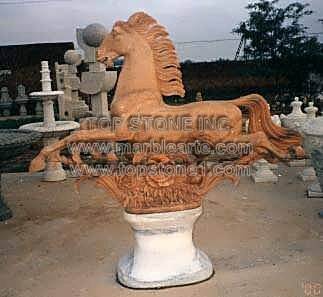 Description: TSAL104 - Galloping Horse Marble Statue - Galloping Horse is a statue marble that the marble artist meant to showcase his marble animals at its finest. Made from fine marble, these marble horse statues can be set up as vintage marble statues, and yard statue. They are famous marble statues made in Italy and sold as marble statues wholesale, that you can even buy as marble statues life size to accommodate into your rather large gardens.